On November 22, 1963, three shots rang out in Dallas, President Kennedy died, and the world changed. What if you could change it back? 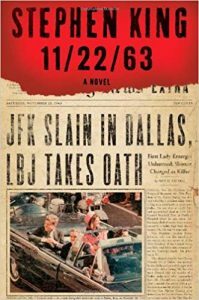 The author's new novel is about a man who travels back in time to prevent the JFK assassination. In this novel that is a tribute to a simpler era, he sweeps readers back in time to another moment, a real-life moment, when everything went wrong: the JFK assassination.ol librarian named Sadie Dunhill, who becomes the love of Jake's life, a life that transgresses all the normal rules of time. 11.22.63 is an American science fiction thriller miniseries, based on the book 11/22/63 by Stephen King. The series is executive-produced by J. J. Abrams, King, and produced by James Franco, who also has the main role. It premiered on Hulu on February 15, 2016, and was received positively by critics. If you like alternative histories, these adult fiction titles are perfect for your reading consumption. Now, your endless questions may be answered: "What would the world be like if THAT had happened OR not happened? Here for the first time is the tale told in Richard Nixon's own words: the terrifying supernatural secret he stumbled upon as a young man, the real stakes behind the Cold War, and the truth behind the Watergate cover-up. What if the man we call our worst president was, in fact, our nation's best defense against demonic forces beyond our comprehension? By the early 1970s, President John F. Kennedy has survived several assassination attempts and is now in his third term. Twenty-two-year-old Eugene Allen returns home from his tour of duty in Vietnam and begins to write a war novel about veterans who have their battlefield experiences "enfolded," wiped from their memories through drugs and therapy. In Eugene's fictive universe, veterans too damaged to be enfolded stalk the American heartland, reenacting atrocities on civilians and evading the Psych Corps, a federal agency dedicated to upholding the mental hygiene of the nation by any means necessary. 1992 Milan. Colonna is offered a fee he can't resist to ghostwrite a book. The subject: a newspaper committed to blackmail and mudslinging, rather than reporting the news. The editor of the paper has a theory that years ago Mussolini's death was faked; in fact, that almost every major news story in Italy's history was a media hoax or a conspiracy. Years of bloodshed and events that seem outlandish - until the BBC proves them true. And then a dead body appears in a back alley in Milan. British special agent Jeremiah Black, an officer of the King's Guard, lands on a lonely beach in the wee hours of the morning in late November 1780. The revolution is in full swing but has become deadlocked. Black is here to change all that. His mission, aided by Loyalists, is to kidnap George Washington and spirit him back to London aboard the HMS Peregrine, a British sloop of war that is waiting closely offshore. Drawing inspiration from a rumored kidnapping plot hatched in 1776 by a member of Washington's own Commander-in-Chief Guard, Charles Rosenberg has written a compelling novel that envisions what would take place if the leader of America's fledgling rebellion were taken from the nation at the height of the war, imperiling any chance of victory. It is the present-day, and the world is as we know it: smartphones, social networking, and Happy Meals. Save for one thing: the Civil War never occurred. In this version of America, slavery continues in four states called the "Hard Four." Underground Airlines is a ground-breaking novel, a wickedly imaginative thriller, and a story of an America that is more like our own than we'd like to believe.